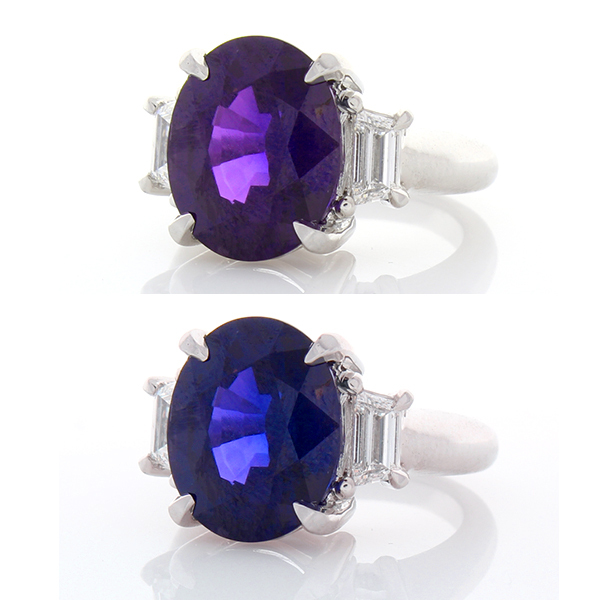 This ring showcases an uncommon natural color-change sapphire that weighs 10.26 carats and exudes a color-change range from violetish blue to purple. The gem source is Sri Lanka; its luster, clarity, and transparency are superb. Two trapezoid diamonds adorn the sides of this sapphire in prong settings totaling 0.75 carats. Designed in brightly polished 18 K white gold, this spectacular three-stone ring is unique due to its natural color-change phenomenon. Accompanied by a GIA certification #3265977603 upon purchase.